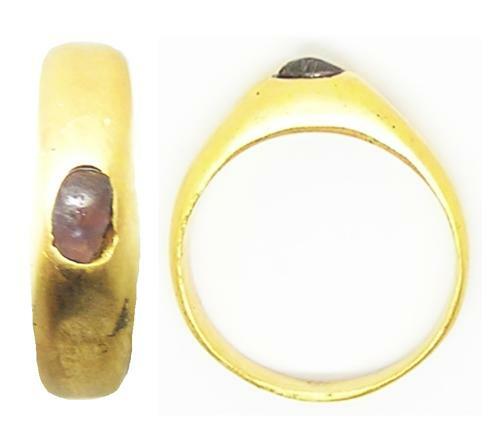 This is a nice medieval gold and amethyst finger ring, dating to the early 12th - 13th century. This ring is of the type known as a 'Stirrup' ring, named by Victorian collectors during the 19th century (due to the shape resembling horses stirrups). Further research and study into this genre of the ring, has concluded the 'stirrup' shape is likely a representation of Gothic arches, as found in the ornate windows of Cathedrals of the period. Such rings are often associated with the ecclesiastic community, such as bishop's, abbots and priors. On this ring the gem is an amethyst, again renowned as the "Bishops" stone worn in episcopal rings. PROVENANCE: Ex. Farrer Collection, New York.